Radial Growth Phase (RGP): The melanoma lesion is described as either having RGP present or absent. If present, RGP indicates that the melanoma is growing horizontally, or radially, within a single plane of skin layer. Vertical Growth Phase (VGP): The melanoma is described as either having VGP present or absent. If present, it is an indication that the melanoma is growing vertically, or deeper, into the tissues. Ulceration: Ulceration is the sloughing of dead tissue. This can sometimes occur in the center of a melanoma lesion. The presence of ulceration may alter the stage classification of a melanoma. Ulceration is thought to reflect rapid tumor growth, leading to the death of cells in the center of the melanoma. Regression: Regression is described as being present or absent. If it is present, the extent of regression is identified. Regression describes an area within the melanoma where there is absence of melanocytic growth. When regression is present, the total size of the melanoma is hard to characterize. Mitotic Rate: This term describes the frequency of division within the melanoma. Higher mitotic rates are associated with more rapidly dividing cells, and therefore larger lesions with greater potential for metastasis. Satellites: Satellite lesions are nodules of tumor/melanoma located more than 0.05 mm from the primary lesion. Satellites are described as being present or absent. Blood Vessel/Lymphatic Invasion: Blood vessel invasion, aka angioinvasion, as well as lymphatic invasion are described as being present or absent. If present, it means that the melanoma has invaded the blood or lymph system, respectively. Shave Biopsy: a superficial area of the lesion is taken off, often with a razor-type blade. Punch Biopsy: the removal of a circular area of skin with an instrument known as a punch, which comes in various sizes- sort of like a miniature round cookie cutter. Incisional Biopsy: the removal of a portion of the affected tissue, for examination, using a knife. Excisional Biopsy: the removal of the entire affected area and often some healthy tissue for examination using a knife. The Interlukin-2IL-2, which works by stimulating killer T-cells to attack melanoma. In some cases with the right body chemistry, helps communicate that message to the killer T-cells and the body begins to fight off the Beast. Antitumor response with prolonged time to progression has been seen in patients with melanoma who have received either of the CTLA-4 antibodies and durable antitumor responses have been observed with ipilimumab in patients with melanoma ovarian cancer, prostate cancer, and renal cell carcinoma It has been seen, antitumor responses may be characterized by short-term progression followed by delayed regression. So lets combine the two clinical trials and that was done by Dr. Rosenberg at the National Cancer Institute. Overcoming immunologic tolerance to melanoma: targeting CTLA-4 with ipilimumab (MDX-010). Targeted biologic therapies such as anti-cytotoxic T lymphocyte antigen (CTLA-4) monoclonal antibodies, either as monotherapy or in combination with chemotherapy or vaccines, have shown great promise in late-stage melanoma, which has a very poor prognosis. Melanoma is relatively resistant to both chemotherapy and radiotherapy. Blockade of CTLA-4, which inhibits T-cell proliferation, promotes stimulation of adaptive immunity and T-cell activation, resulting in eradication of tumor cells. Two human monoclonal antibodies are under investigation in melanoma. Phase II and III clinical trials are currently evaluating the efficacy and safety of ipilimumab (MDX-010, Medarex, Inc., Princeton, NJ, and Bristol-Myers Squibb, Princeton, NJ) and tremelimumab (CP-675,206; Pfizer Pharmaceuticals, New York) in melanoma. Data are available on ipilimumab, which has been explored as monotherapy and in combination with vaccines, other immunotherapies such as interleukin-2, and chemotherapies such as dacarbazine. Overall response rates range from 13% with ipilimumab plus vaccine in patients with stage IV disease to 17% and 22% with ipilimumab plus dacarbazine or interleukin-2, respectively, in patients with metastatic disease. Responses have been durable, and among those experiencing grade 3 or 4 autoimmune toxicities, even higher response rates have been seen--up to 36%. While the optimal dose of ipilimumab has yet to be established, studies also indicate that higher doses may be more effective. Importantly, the lack of an initial clinical response may not predict ultimate treatment failure, because the onset of a response may follow progressive disease or stable disease. Pending results from registration studies with ipilimumab and lessons learned from registration studies conducted with tremelimumab will help to define the role of anti-CTLA-4 blockade in the treatment of metastatic melanoma. Dacarbazine (DTIC-Dome®) Your doctor has ordered the drug dacarbazine to help treat your illness. The drug is given by injection into a vein. Dee and I would like to extend our warm wishes this Holiday Season. This past year has many things to ponder over. I for one, am grateful to be able to share with you my journey against the Beast and at the same time able to help others in their fight too. I am also so saddened that we lost so many Carepage friends in the battle. 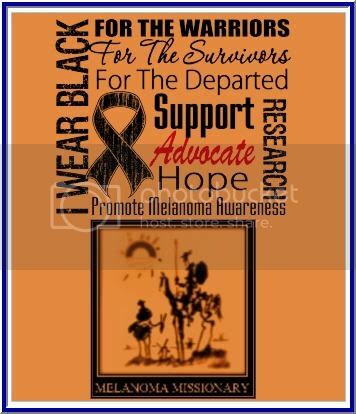 I read somewhere that 68000 will be diagnosed with Melanoma this year and 8400 will die as a result. Even One is way too many. I have dedicated my time and efforts to educate myself and others on this subject matter so we can find the PATH. It is not easy, but it gives me purpose in life other than my Family and friends. WE TOGATHER CAN HELP FIND A CURE. To all the Patients that are trying clinical trials, I would like to take my hat off to you. In time of need, you are the sacrificial lambs that are thrown into the Cave of the Beast. You are on the front line willing to fight for another day. In my book, you are all Heroes.And we can’t forget the caregivers. They are in the trenches with us, holding our heads up so we can take aim at the Beast. For they are unsung Heroes that are never mentioned but dissevered better. I guess I am starting to ramble on. This could be the year of the Cure!!! CT Scan Has been Schedule!!!! CT scan has been schedule for Nov. 5 th 2:00 PM at Science Park in Rochester N.Y. Still trying to setup MRI. I think it needs another referal. Still working on the appeal. Also, STILL WAITING ON THE DENIAL LETTER THAT THE REFERAL WAS DENIED ON 10/06/2008. I should Have received the letter in 7 working days. I think it is comming to me from Pony express. I only have 60 days to appeal this decision or I can't appeal it. I have already in their eyes used up one third my allotment time. As announced in September 2006, Preferred Care, MVP Health Care and CIGNA health care have formed an alliance to offer companies with employees residing in multiple states, including upstate New York, fully insured and self-funded PPO and EPO health benefit plans. Members of these plans will access the MVP Health Care provider network locally and the CIGNA health care provider network in areas outside of upstate New York. Such plans will be offered to qualified employer groups as of July 1, 2007. Preferred Care’s and MVP’s self-insured and fully insured PPO products will be offered to qualified employer groups through the Alliance. That is, employer groups that qualify for affiliation members can see CIGNA practitioners outside of the Preferred Care and MVP service areas. In those instances, CIGNA will manage their care in accordance with the member’s benefit plans. Select counties in New York will be a part of the Alliance. For a listing of these counties, and other commonly asked questions and answers about the National Alliance, click here. For Current Preferred Care ProvidersIf you practice in one of the aforementioned counties in New York, you have received, or will receive, an amendment to your participating provider contract that enables you to see CIGNA members. As a result of agreeing to the terms of that amendment, your name and practice location(s) will be listed on CIGNA’s Web-based and print directories. Therefore, you may treat CIGNA members if you have agreed to the terms and conditions of the amendment. When treating CIGNA members, you will need to follow the CIGNA member’s plan requirements. Please click here to view the online tools that CIGNA offers to health care providers treating CIGNA members as well as contact information. There is an online demo you can view to see how to register and use the Web site. A sample of a CIGNA ID card you may see when treating CIGNA members can be viewed by clicking here. If you have questions for CIGNA health care about claims submission for CIGNA members after reviewing the information provided here, please call 1-800-8CIGNA (822-4462). Preferred Care will be ready to work with CIGNA and you to help get payment for covered services in the unlikely event you encounter difficulties. If you are unable to rectify an issue, please contact our Professional Relations Service Center at 1-800-999-3920. If you still have questions about the alliance, or have not received an amendment to join us in the alliance, please contact your Professional Relations representative. I told Leslie my brief medical history ha ha. She was quite concern about what has transspired and put me on hold to help to see if this should be a legal issue. I should hear back from their office sometime next week. In the mean time on the other extension,the case Manager Supervisor From preferred care call me to tell me that Dr. Vaughn from Eastman Kodak (Head of Medical) has contacted them and was quite concern. Soooooooooooo now let me introduce myself. You can call me Winne the Pooh and boy!!!! I have stirred up the hornets nest. I was able to get a hold of my original oncologist at the Wilmot Cancer center here in Rochester who wrote the first letter to Preferred Care back in 2005. That letter help secure out of network service. He agreed that I should continue to receive my care at the Hillman Cancer Center.He is going to write a new letter and attach the old one and send it to preferred care. Things are starting to fall in place. As I am writing this I recieved a Phone call From Pittsburgh. Dr. Kirkwood's letter of necessity is on it's way. Physician ResultsFor each physician listed below, the first report is only $12.95 and $9.95 for each additional Physician Quality Report on this order only. *Robert F Asbury, MD Rochester, NY MaleOncologyNow you have to pay 9.95 to get a listing ????? "HELLO!!!! knock.. KNOCK HELLO!!!! I guess no one is home. The porch lite is flickering!!!!! The person who sent me this list doesn't know his radiation oncologist to a medical oncolgist. They are two extremely different species. I would neeed a medical oncologist, DAH...H ! I wonder what else is coming down the road. AS YOU CAN TELL BY MY HANDWRITING, I AM ANGRY AS HELL AND I WILL NOT TAKE NO FOR AN ANSWER. After my donut, I am actually happy. Now I have something to pass my time. This morning I wrote a preliminary appeals letter. After receiving a verbal denial of coverage on 10/22/08 I have decided to appeal your decision to deny coverage of my recommended treatment plans for Melanoma cancer from Dr. John Kirkwood at the Hillman Cancer Center in Pittsburgh , Pa.. It was stated to me over the phone that the service sought is available locally here in Rochester. I requested numerous times to you staff for a list of specialists in melanoma who could treat my type of cancer including clinical trials locally and none was given. This is just a prelimarily letter of appeal to get the process started. I will be forwarding more supporting documentation to support my appeal in the near future. I have enclosed a copy of Dr. Kirkwood’s credentials. After that, I had Medicare file a complaint on my behalf. I also contacted the New York State Health Insurance Dept. I am presently waiting for a call back. So if you don't hear from me for awhile, I am only a key stroke away. It is time to roll up the sleeves!!!!!!!!!!!!!!! gives these rights to enrollees of managed care organizations. You may also ask the health plan for this information before you join the plan. * You have a right to know what health care must be given to you by the plan, as well as any limits on care, and which types of health care are not covered. * You have a right to know about any treatments or health care which your plan needs to approve in advance. * You have a right to know what steps you can take if the plan will not cover a service. This includes the toll-free phone number of the person who will review the plan's action, how long it will take until the review is done, how to appeal the plan's action, and how to file an independent external appeal with the State. * You also have a right to have someone speak for you in any disputes with the plan. * You have a right to know, each year, how the plan decides on how much it will pay to doctors and health providers who belong to the plan. * You have a right to know about any fees you will have to pay, any amount you have to pay yourself before the plan will start paying, and any caps (maximums) or yearly limits on plan payments. * You also have a right to know what you will have to pay for health care not covered by the plan. * You have a right to know about what you will have to pay if you go to a doctor who is not part of the plan, or if you get care that the plan has not approved in advance. * You have a right to file a grievance about any dispute between you and the plan, and you have a right to know just how a grievance should be made. * You have a right to go to the emergency room 24 hours a day for any health problem that threatens your life. You do not need the plan to approve this in advance. * You have a right to a list of the plan's doctors, as well as to learn which doctors are taking new patients.You have a right to know how you can change to a new doctor within the plan. * You have a right to a see a doctor outside the plan if the plan does not have a doctor who can meet your health needs, but your primary doctor must set this up for you. * If you need to keep on seeing a special doctor (specialist), you can ask to be allowed to see that doctor as needed, without going through your primary doctor. Your plan must explain to you how you can do this.If you have a very bad health problem that requires you to be seen by a special doctor for a long time, you can ask to have your special doctor be your primary doctor. The plan must tell you how to make such a request. * If you have a very bad health problem that requires you to be seen by a special health care center (for example, a hemodialysis center) for a long time, you can ask to go there when you need to, without going through your primary doctor. The plan must tell you how to make such a request. * You have a right to know how you can have input in how the plan makes its rules. * You have a right to know how the plan meets the needs of plan members who don't speak or read English.You have a right to know the correct mailing address and phone number to be used by plan members who need to know something or who need the plan to approve a health service. * You have a right, as a female enrollee, to see a plan gynecologist or obstetrician for at least two exams per year and for all pregnancy care, without a referral from your primary doctor. * You have a right to a list that the plan updates once a year, of the name, address and phone number of each health care provider who belongs to the plan. This includes special doctors (specialists). * You also have a right to know the level of training that the plan's doctors have, and which ones have advanced training so they can practice in special health areas (board certification). Medical Insurance Preferred Care Advantage has denied my request for out of network service !!!! I am outraged!!! I was forced to switch to Preferred Care Gold Advantage due to being on LTD for two years on August 1st 2008. Prior to switching products, Perferred care allowed me to recieve out of network care due to the lack of specialists in Rochester N.Y.
All I can say is that I am going to fight this to the end. Today at about 1:00 pm I recieved a call from my PCP (Primary Care Physician) stating that my insurance has denied my request to see my Oncologist in Pittsburgh. I also got a call Preferred Care stating that there is a product called Preferred Care worldwide that has service anywhere and was asked if it is one that Kodak uses. I told them that I don't think it was part of Kodak's health package. So I called my Caseworker from Preferred Care Polly Johnston. She said she would look into it. I also called Kodak (Joann Powell) From EK Benefits. I didnot call the Kodak Employee Service Center because it just takes my phone call offshore to an Phippene Call Center. So now my blood pressure is through the roof. I started to make a list of people I would contact if it is not resolved in my favor. Pss, I also contacted Kodak's Head of Medical. Now I just have to hope that they reconsider my situation. I would just like to let everyone to know that we are presently setting up another CT scan and visit to Pittsburgh. I am having a little trouble getting a referal due to the medical insurance change to medicare and Preferred Care advantage. It looks like I have to start the process over due to the medical visit is out of network. There alway seems to be alot of hoops to jump through. I will let you know when everything is set up.Presently, I am in good spirits and my health seems fine. The leasion on my back appears to be getting smaller. I think my immune system is still active from the clinnical trial. That's a good thing. I do get tired easily, but that could be from the chemo. That is it for now, stay in touch. 2). There are small areas of skin thickening posteriorty in the back at site of prior metastasis. These areas have been stable since at least 1/08. They are slightly reduced versus 2/07. 3). No suspicious pulmonary nodules. Sooooooo it looks like a great report. The Monster is back in it’s cage for now. I am still a little leery about the laceration that is still healing at the original site. Is it Cancer or something else.I think when I go back to Dr. Brown this fall for a skin checkup, I will ask him to biopsy it if it still has not healed. Sooooo now I can call myself a cancer survivor. Thanks to your Prayers and Support, I am on the road to recovery. You have helped me crossed to the other side of life. It has made me a more humble person and not to take life for granted. Live each and every day as if it will be your last. Open your eyes and heart and let the world in and give back a little something each day. It doesn’t have to be big. (A smile, a hello, a helping hand etc.) If we each did this, the world would be a better place. Well, I had my Full Body PET scan yesterday. I had to go through some hoops to get this one approved by the insurance company. Anyway, I went from one appointment to another. The PET Scan ran about 2 – 3 hours in total. I then went home for lunch because I was so hungry. I was not allowed to have any food 6 hours prior to the testing. Then At 2:15 pm I had a follow up with Dr. Marc Brown. He is the oncology/Dermatologist/surgeon. Every 4 to 6 months he checks my skin for any funny looking moles. If he finds one, he does a biopsy right away. No fooling around. He tends to error on the side of caution. I should get the results some time next week. I have my fingers crossed. Thanks for visiting. Your support is greatly appreciated. Hell, there is no one here most of the day, so you are my contact to the outside world. 7/16/2008 Happy B day Byron!!!!!! It was great to see everyone at Kodak. Boy, things have changed since the last time I was there. I am doing OK these days. Just following the "Honey to do List". The Kids are now out of the house so the bedrooms are getting an overhaul. The posters come down and the walls get a new coat of paint. Anyway, I am waiting to hear from Pittsburgh on when my next PET scan is. It is about a month over due but who is counting when I am feeling good. I am slowly getting my strenght back and have begun taking walks along Lake Ontario is one of the five Great Lakes of North America. It feels so good to get out and about. I Love going to Green Acre farm to pick blueberries. The weather has been great. That is it for now. I will keep you in the know.Stay in Touch. 5/5/08 Happy Cinco De Mayo Day!!!!! I have been bad with keeping up with the updates. My visit to the Hillman Cancer Center went very well. Dr. Kirkwood is cautiously optimistic that we may have beaten the dragon for now. The Next time I get a scan it will be a PET Scan. This will tell us if there is any metabolic cancer activity in my body. I know it has a limitation down to 0.5 mm in size, so I will just have to accept it. He did have me see this doctor Howard D. J. Edington for the laceration on my back. He is a Surgical Oncologist/ Plastic/Reconstructive surgeon. He gave me an ointment to see if it would heal. So far it looks like it may be working. Dee puts it on daily (three times) because I can’t reach it. Life Is Good… Just waiting for Spring/Summer to arrive. Jess will be coming home from Belize (Semester abroad) just long enough to pack up to go back to Burlington Vt. For the summer and final year of college. Chris is finishing his first year at RIT and will be moving into a house with five others. So we will be Officially be empty nesters this summer. Where has the time gone. They are like little birds trying out their new wings and trying to fly on their own. Hopefully they will come home to visit from time to time. Well , thanks for all your prayers and support over these last three years. They seem to play out like a movie with a happy ending. With Act one and two complete, I can’t wait to see what Act three brings. Thanks for reminding us to stop and smell the roses. Life is too short. This is a poemwritten by a teenager with cancer. She wants to see how manypeople get her poem. It is quite the poem. Please pass it on. 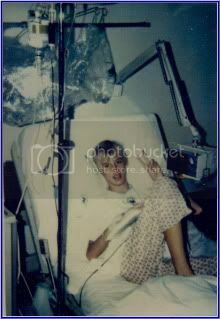 Thispoem was written by a terminally ill young girl in aNew York Hospital . Dear All: PLEASE pass this on to everyone you know -even to those you don't know! It is the request of a special girl who will soon leave this world due to cancer. This young girl has 6 months leftto live, and as her dying wish, she wanted to send a letter telling everyone to live their life to the fullest, since she never will. It has been quite a while since my last login. There hasn’t been a lot of note worthy news so I elected to keep off the chat line. I did however, have some problems with my diabetes. On January 28th, I started to get tingling/ sensitivity in the bottom of my feet to my knees. It was the on set of neuropathy. It was due to the lack of exercise. I have been battling Cancer Related Fatigue. So I started off very slowly with walking a mile a day. At the same time my weight had exploded to 235 lbs. I looked like I swallowed a watermelon. Within in a couple of weeks the neuropathy seemed to reverse itself. So I continued walking and I am up to 6 miles a day and have lost 15 to 20 lbs. Most days I have to push myself to get walking. I have cut most breads/starch out of my diet to keep my blood sugar under control and it seems to be working. The Fatigue comes and goes, but I have grown accustom to it. So here we are today, Easter, A new beginning. So I have another MRI scan this Tuesday at 3:45 pm at Science Park. All I can hope for is steady as she goes. It has been a year since my last Clinical Trial with IL2. Life FEELS WONDERFUL WHEN YOU HAVE A SUPPORT TEAM LIKE I HAVE. I just got my CT Scan Report back. Basically it said my cancer has been stabilized. It is not shrinking but not growing either. So I am good for another couple of months. I talked with Melissa DeMark about new clinical trials that are under way. You must always be prepared for the next fork in the road. Based on the results of Interlukin-2 trials complete responders had a “median follow-up time of 10 months, median survival time was 42 weeks (95% CI, 19.1 to 86.6 weeks)”. That is not to say that my response could be longer.My wife says I have to stick around at least until our children finish college. She hates filing the FASFA forms for Financial Aid. Well I hope to talk Dee into going out to celebrate because I don’t feel like cooking tonight. I want some time off for good behavior. My Cousin Tommy & Sabrina's son was in an accident this past week. He had just returned to college in South Carolina from the Holiday Break. He was struck while jogging I believe Wednesday morning. I was told that he has broken both his legs. Please Pray for him to have a speedy recovery from his injuries. And also for his family's safe return to New York. Sorry that I have not posted sooner but I was on a journey from the Heartland. That is another story. Anyway, Do you Know what time it is? It is CT scan time. Time to check this old body for any supprises. I have scheduled a full body CT scan with University Imaging at Sceince Park here in Rochester. It is scheduled for Tuesday Jan. 15 2008. It should be a piece of cake. I have these scan every 2 months to check to see if there is any cancer growth that we (the doctors and me don't know about). I am a little concern about the turnover of the nurses working with Dr. Kirkwood. Two have moved on to other positions somewhere. Is it the pay, or something else? It makes it tough on trying to comumincate over the internet. When the E-mail bounces back with an address error, it makes you wonder. I will post the result as soon as I get the report.